Biscotti is Italian for 'Biscuit;.It is the plural of Biscotto which also means 'twice baked'.These are twice baked for longer storage,but I can assure that once you taste these,they won't be there for long. :D I found a wonderful cherry biscotti from here and they were wonderful. Blend tofu with soymilk or water to obtain a creamy paste.In a big bowl,cream together sugar and tofu until well blended.To this,add orange juice+oil+vanilla extract.Blend until combined.You can also add orange zest,but I did not add any.In another bowl,add flour,baking powder,walnuts and salt. Add the flour mix in batches to the tofu-sugar-oil-juice mix.Stir gently until combined to obtain a sticky dough.Fold in the chopped cherries.I used boxed cherry halves in syrup and so I only corasely chopped some,while adding others as such. 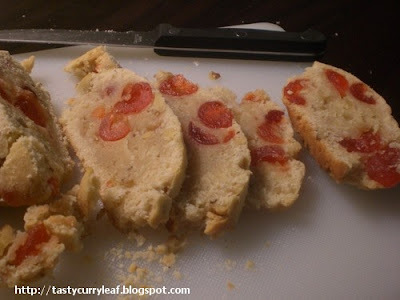 Do not over mix the flour,as this kneading increases gluten development.We do not want gluten as it makes the biscotti chewy.Gently folding flour with the wet items reduces the formation of too much gluten.Also gently fold in the cherries. Once the sticky dough is formed,transfer it to a lightly floured surface (baking sheet as well)and shape it into a log.Transfer it to a baking sheet and gently flatten the top.Brush the surface with milk and sprinkle with sugar.Bake in a preheated oven at 350F for 35-40 minutes until the top is lightly browned and cracks appear.The recipe specified an oventime of 25-30,but it took nearly 40 minutes to me.Reduce the oven temperature to 300F. Place these pieces cut side up on a baking sheet with atleast 1 inch between them and bake at 300F for 8-12 minutes.Then flip to the other side and bake again for 8-10 minutes.Cool for a few minutes and enjoy.The biscottis were crunchy,crusty,hard outside and nutty inside and perfect with or without a cuppa. Also,I have to confess,these do not look as perfect as professional biscotti or even as I want them to be,coz my oven in the midst turned off and while cutting,my knife was behaving very badly.So I had to make do with these,but they were excellent in taste.I usually avoid cherries,but this time in a biscotti,they were perfect.Next time I will ensure everything is perfect(my fingers are crossed and I will be buying a new knife). 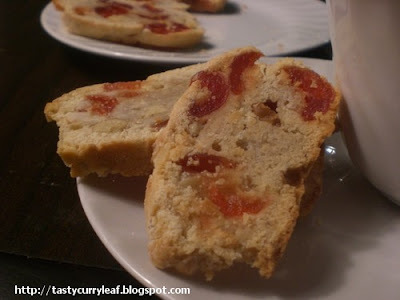 Also though I used the abovementioned recipe,I referenced this -which has step by step techniques and pictures-as well.The above estimate yields almost 1 dozen biscotti,which were quickly polished off. These biscotti fresh from the oven are on the way to AFAM: Cherry an event started by Maheswari and currently hosted by Rachel. haa cherries in the middle make them so tempting...i love to have them during tea time..so crunchy..
Wow delicious biscotti, as raaji told cherries in the middle make them so cute n yummy.. They look gorgeous and home made. They don't have to look perfect to taste great! Yeah, and I am back... :) Whoo hoo! Great idea to add cherries! These sound like a perfect afternoon treat. I think they look just fine!Homemade with love is simply adorable.Thanks for sharing the recipe. Very appetizing with blast of cherries! have had biscottis with nuts never cherries in it...looks gorgeous. 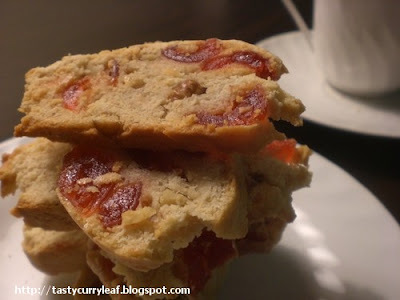 ooh I love biscotti & these look truly divine! Wow looks delish. Love the idea of adding tofu. Yum! Nothing like homemade biscotti... Storebought versions tend to shear the roof of my mouth if you know what I mean. Nice idea to use tofu to replace egg in the recipe. But was it moist? I guess I'm asking too many questions. If possible send it across to me with the picture, I'll include it in the tofu round up.